The For All Healthy Living Company aims to provide services, facilities and activities that reflect what local people really need and want. The cafe is at the heart of the centre, where friendly staff offer a range of drinks, snacks and meals. It is a place to sit, meet friends and catch up with life. FAHLC also runs a busy lunch club for some of the local older residents. 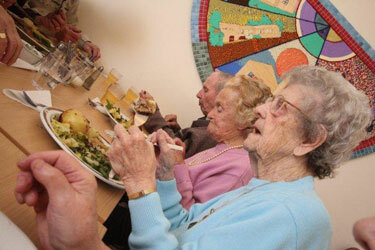 As well as offering a hearty hot lunch Tuesday to Thursday, the club provides social activities such as trips. As well as the regular Sunday morning and evening services, the church is open each weekday from 9.30am until 5.00pm offering local residents a chance to find a quiet space for reflection, help or advice. Services reflect both the Church of England and Methodist traditions. St Andrew's Church can be contacted on 01934 427420. The large community hall at the For All Healthy Living Centre can be hired by local groups and individuals for private functions such as parties, wedding receptions or big meetings. Find out more about our rooms for hire. FAHLC has recently taken on the development of a community allotment just 5 minutes walk away from the centre. The land will provide a local space that residents can use to create an allotment of their own which will be used to grow fruit and vegetables as well as a place to relax in the fresh air.